This Timer has a built-in voice module which automatically gives the required commands for the event selected with the selector-switch. 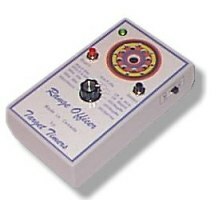 The on board tone generator will give a one half second long tone to start and a one second long tone to stop. The unit comes with volume control as well as an output jack for earphones. This output can also be used to feed into the high input of a P.A. System. This feature lets you run a firing line if the turning targets malfunction.Never before has there been such a versatile unit at such a small price. Price: $299.00 US (plus $25.00 shipping (per unit) to continental U.S.
• Bianchi cup 5 sec. • Duty Pistol 2 sec. • Duty Pistol 3 sec. • Duty Pistol 6 sec. • Duty Pistol 8 sec. Range Officer PPC model can you change the PPC 150 sec setting to B.Cup 7 sec. The rotary selector switch lets you select the event you want to shoot. After loading your rounds all you have to do is press start.The commands for the selected event will be given immediately. Fire will be indicated by a one half second long tone. The cease fire is indicated by a one second long tone. The loudness can be adjusted with the volume control. The timer will reset itself automatically 5 seconds after completing the event. To shoot the second string of 5 rounds all you have to do, is load 5 rounds and press the start button again. This system will let you practice a match anywhere giving you match conditions. The On – Off switch is located on the right hand upper side of the unit. The Volume Control is located on the left hand upper side of the timer. Turn the power switch to on. The green light on the front panel will turn on. When you hear a pop from the speaker (approx. 6 seconds after turning the power on) the system is ready. Select the event you want to shoot using the rotary selector switch. The system will reset itself 5 seconds after a sequence is completed. To connect ear plugs simply insert the plug into the socket located on the top of the timer. The internal speaker will automatically be disconnected . The ear phone should have a 3.5 mm mono plug installed on it. CONNECT TO A P. A. SYSTEM. Connect the output of the timer to the high auxiliary input of the amplifier. CAUTION: Do not connect it to the microphone input. This could result in damage to the amplifier. Turn the volume on the timer to low and find the best setting when operating the system. The voice commands can be switched off by setting the slide witch marked “V” to off. To give the commands manually the range officer must give the commands to fit into the time slot provided after pressing start by the micro controller. An external power transformer is supplied with this model. It can be connected without first removing the battery from the timer. This timer does not require any maintenance other than changing the battery. However it should be treated as a precision electronic instrument. Do not leave it on the backseat of a car when the outside temperature is extreme high or extreme low. As the battery gets to the end of life. Sometimes the tone will become longer in duration or will not end. Time to change the battery. The Frequency of the tone generator may change slightly with temperature. This is normal as the generator is not crystal controlled.